Born Yaw Oduro- Agyei known, in the music industry as Trigmatic married his wife, Dita Schandorf somewhere last year, 2017. 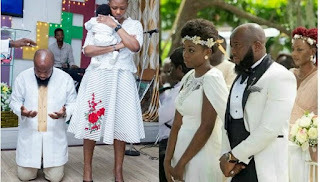 Trigmatic shared the photos of his child after his family was blessed with their first child and an out-dooring has been held at their church. According to the singer, God gave him the child and for that matter, the almighty should be worshiped by him.